Aflac, a leader in voluntary insurance sales at U.S. worksites, announced today a full slate of activities to honor children and families facing childhood cancer during September, which is National Childhood Cancer Awareness Month. During this month-long focus on families, the company will begin delivering its latest innovation, My Special Aflac DuckTM, a robotic duck designed to help children and families dealing with cancer. Aflac, a proud sponsor of Children’s Miracle Network Hospitals®, currently has two September programs scheduled at affiliated hospitals in Atlanta and Columbia, South Carolina, where children will receive the very first My Special Aflac Ducks. As part of its ongoing Aflac Childhood Cancer Campaign®, the company plans to distribute the comforting robots nationwide to children ages 3-13 who are newly diagnosed with cancer, free of charge when requested through a treating hospital. Aflac will also observe Childhood Cancer Awareness Month by ringing the opening bell at the New York Stock Exchange on Sept. 10 and through an appearance on ABC’s “Good Morning America” on Sept. 14. During National Childhood Cancer Awareness Month, Aflac will also unveil its 2017 Aflac Corporate Social Responsibility Report, celebrating the company’s responsible and ethics-based actions and activities. 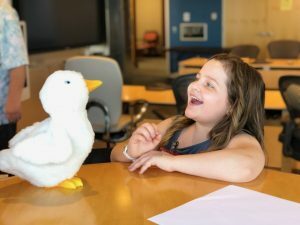 Others are rallying behind the Aflac Childhood Cancer Campaign this September, including country artists Chris Young and Chase Bryant, who participated in a special preview of My Special Aflac Duck for a group of children with cancer in Nashville, Tennessee. Powerful video footage captures the moment when the children received their first opportunity to interact with the robotic duck and see how it can help them through their journey. To see My Special Aflac Duck in action and to learn more about Aflac’s dedication to this important cause, please visit AflacChildhoodCancer.org.